Spring is in the air! That means a burst of life in our coastal wetlands. You may already see flowers blooming, new leaves on trees, and a variety of migratory birds returning to their nesting habitat. Today, on the first day of spring, let’s explore the annual rebirth of Louisiana’s coastal habitats. As plants proliferate in the warmer temperatures, so too a riot of colors joins the landscape. Some coastal favorites are seaside goldenrod (Solidago sempervirens), buttonbush (Cephalanthus occidentalis), and salt marsh morning glory (Ipomoea sagittata) for good reason: they produce attractive flowers that saturate the wetlands with color. Other plants have less colorful flowering and fruiting structures but are more prevalent. Many sedges (Family Cyperaceae) are beginning to put out their iconic inflorescences, the branching flower clusters, as are several grasses (Family Poaceae). Other popular marsh plants including Juncus and Spartina species also begin their pollination cycle. The reliable reproduction of these graminoid (grass-like) plants is helpful in CWPPRA marsh creation projects because those species repopulate new land more quickly than woody plants. Once they move in and put down healthy roots, they demonstrate the effectiveness of CWPPRA projects and their success! Plant enthusiasts aren’t the only ones excited for springtime; wildlife watchers, especially birders, see an infusion of new plant growth and wildlife offspring. Many birds return from their wintering grounds in South America to the warm nesting grounds along the Mississippi Flyway. Songbirds like the beloved prothonotary warbler (Protonotaria citrea) fly across the Caribbean, the Gulf of Mexico, and our coastal waters to take advantage of the new plant life and insect population booms. South American migrants use the flyway to get further north alongside other species that use our coastal zone as a wintering habitat. Whether they are just stopping over or will be staying for the summer, Louisiana’s spring is one of the most exciting times to birdwatch. Ultimately, birdwatching success diminishes at the same rate as our disappearing coastal wetlands. Habitat loss has major implications for population declines of bird species. Because birds have “favorite” wintering and nesting habitats, they are especially susceptible. Both their wintering and nesting habitats face the threat of deterioration and require protection. This part of the year is great for exploring all the natural areas that Louisiana has to offer, we suggest that you find a day that works in your schedule and visit a wetland near you; you’re bound to find something interesting. We wish you all a happy spring and encourage environmental stewardship each and every day! The Lac des Allemands River Basin Initiative identified the following specific problems within the Lac des Allemands Watershed: drainage impairments; water quality impairments; loss of marsh; and decline of cypress forest. Many years of study by Louisiana State University researchers in these swamps have demonstrated that, because of impoundment, subsidence, and inadequate accretion of sediments and organic matter, some areas are already highly stressed and converting to open water, floating aquatic plants, and fresh marsh. Also, the Coast 2050 report suggests that other areas of the swamps throughout the basin will likely convert to open water or floating marsh by the year 2050. These problems are caused by the loss of river water along with the associated sediment and nutrients necessary for swamp health. The loss of river water can be attributed to the leveeing of the Mississippi River. Impoundment caused by roads, drainage canals, and spoil banks is also a major cause of degradation of these swamps. The original proposed restoration strategy included installing two small siphons (averaging 400 cubic feet per second) to divert water from the Mississippi River; gapping spoil banks on Bayou Chevreuil; gapping spoil banks along the borrow beside Louisiana Highway 20; installing culverts under Louisiana Highway 20; improving drainage in impounded swamps; and planting cypress and tupelo seedlings in highly degraded swamp areas. The proposed diversion from the Mississippi River was to bring fresh water, fine-grained sediments, and nutrients into the upper des Allemands swamps, which would have helped maintain swamp elevation, improve swamp water quality, and increase productivity and regrowth of young trees as older trees die. However, after hydrologic modeling and more detailed engineering/design and cost estimation, it was determined that the siphon would cost far more than originally anticipated. For that reason, the CWPPRA Task Force approved the project sponsors’ request to re-scope the project to eliminate the siphon feature, and to focus on the remaining project features. Location: The project is located West of Lac des Allemands in St. James Parish, Louisiana, south of the town of South Vacherie, bordered on the south by Bayou Chevreuil, and on the east by LA Highway 20. 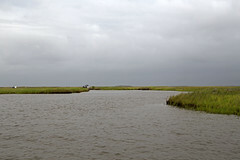 Progress to Date: The Louisiana Coastal Wetlands Conservation and Restoration Task Force approved Phase 1 funding in January 2001. In June 2013, the Task Force approved a request to change the scope of the project to eliminate a siphon feature and focus on the remaining original hydrologic restoration and vegetative planting project features. The Louisiana Coastal Protection and Restoration Authority performed the engineering and design services. Design was completed in October 2015 and Phase 2 funds for construction was approved by the Task Force in January 2016. Construction activities for excavation and placement began in October 2017 and ended on December 20, 2017, vegetative plantings occurred in late January, and officially completed on February 2, 2018. 3. Seven hundred (700) Bald Cypress and one hundred (100) Water Tupelo saplings were planted in the constructed spoil placement areas to start swamp regeneration and swamp productivity. This project enhanced 2,395 acres of swamp habitat that would have continued to degrade without the project. This project is on Priority Project List (PPL) 10. As April passes into May, many migratory birds leave the tropics of Central and South America in search of bountiful summer resources in the sub-tropical United States. Among them, the very charismatic Prothonotary Warbler flies from the northern tropics to the hospitable habitats of the United States. Prothonotary warblers live in forests near bodies of slow-moving water where they can hunt for insects and nest in cavities in trees. The cypress swamps of Louisiana are about as good as it gets for a prothonotary warbler, and they stay from April to August. If you get out into the swamp during the summer, look for their bright yellow figures darting through low-lying foliage. Prothonotary warblers have experienced a population decline in recent years that experts attributed to the destruction of their wintering habitat in the tropics. To improve breeding success and survivorship, the Audubon Society and other ornithological enthusiasts have encouraged people to install nest boxes that help to protect warbler nests from failing. Many natural threats exist in swamps for warblers, including a variety of snakes, birds of prey, and mammals. Since brown-headed cowbirds will use prothonotary nests to lay their eggs in when given the chance, nest boxes are suggested to have a 1¼“ hole to prevent larger birds from entering the box but still allow the warblers to enter. Boxes are not left on the ground, and are often mounted on poles. Some predators can climb, so many boxes have a skirt/collar that prevents snakes, raccoons, and cats from climbing the poles into the nests. More guidelines for a good nest box can be found at https://nestwatch.org/learn/all-about-birdhouses/features-of-a-good-birdhouse/. Kaufman, Kenn. “Prothonotary Warbler.” Audubon, National Audubon Society, 10 Mar. 2016, http://www.audubon.org/field-guide/bird/prothonotary-warbler. Brannon, Peter. “Adult Male.” All About Birds, The Cornell Lab of Ornithology, Florida, 14 Sept. 2016, http://www.allaboutbirds.org/guide/Prothonotary_Warbler/id. In 1963, the Bald Cypress (Taxodium distichum) was designated as Louisiana’s official state tree. The bald cypress’s deciduous character, unlike most conifers gives, it a “bald” appearance. This type of tree is rather majestic and can be spotted in the swamps of Louisiana. It has a swollen, ridged trunk at the base; widespread branches; reddish-brown bark; and roots that often cause what we know as cypress knees to appear around the tree. Although the bald cypress is widely adaptable, it prefers to grow in wet, swampy soils. Riverbanks, floodplains, and wet depressions are specific areas in which the bald cypress thrives. Bald cypresses provide habitat benefits to terrestrial and aquatic wildlife. The Louisiana forestry industry is also dependent on these cypress trees to contribute to a productive annual harvest with large monetary returns on the lumber and cypress mulch produced. The Atchafalaya Basin makes up a large share of the coastal wetlands, and more the half of the acreage of the Atchafalaya basin is cypress wetland forest. The bald cypresses of the wetlands are important to Louisiana’s culture, animal habitats, and the economy. Maintaining healthy cypress wetlands is critical to maintaining a natural storm buffer, filtering polluted water, providing irreplaceable habitats, and sustaining a thriving economy. On May 23, we celebrated the 17th annual World Turtle Day sponsored by American Tortoise Rescue. This nonprofit organization was established in 1990 to protect all species of tortoises and turtles. They created World Turtle Day to serve as an annual observance of protecting tortoises and turtles around the world and their disappearing habitats. Wetlands that serve as habitat for turtles include shallow fresh waters, pelagic salt waters, and heavily and scarcely vegetated areas. Various species of turtles reside in every type of wetland environment. The majority of turtles that you see on the road are females traveling to their annual nesting sites. Turtles like to eat dead material lying on the bottom of ponds, lakes, and wetlands. Turtles keep the water clean! Snapping turtles rarely snap at humans in water. They do not like the way people smell or taste. If you are helping a turtle cross the road, be sure to move the turtle in the same direction it was originally headed. DO NOT turn it back around! It is likely it will try to cross the road again. If you touch a turtle, it is important that you wash your hands thoroughly. Turtles may carry salmonella. Avoid walking or driving on sandy areas where turtles are nesting. Create a “no wake zone” to reduce damage to shoreline wetland habitats and stop the removal of plant materials. Do not remove turtles from their natural habitats. You can put signs and small barriers around nesting sites and wetlands that are on your property. You can contact local programs to help pay for habitat restoration in your area. You can add beneficial features to turtle habitat by planting native plants to buffer wetlands and turtle nesting areas. This will attract frogs, snails, insects, and other species that turtles eat. Restore America’s Estuaries (RAE) is a non-profit organization dedicated to the protection and restoration of bays and estuaries as essential resources for our nation. RAE member organizations restore coastal habitats in 11 estuaries and 16 states nationwide. RAE is also involved in the economics and valuation of estuaries, blue carbon, living shorelines, national advocacy, and a wide range of coastal restoration issues. The Coastal Society (TCS) is an organization that is dedicated to actively addressing emerging coastal issues by fostering dialogue, forging partnerships, and promoting communications and education. TCS is comprised of private sector, academic, and government professionals and students who are committed to promoting and effectively improving management of the coasts and ocean. Restore America’s Estuaries and The Coastal Society hosted the 8th National Summit on Coastal and Estuarine Restoration and the 25th Biennial Meeting of The Coastal Society on December 10-15 at the Hilton Riverside Hotel in New Orleans, La. The Summit is an international gathering encompassing all disciplines within the coastal and estuarine restoration and management communities. RAE and TCS worked with 200 partnering and supporting organizations to develop the Summit program and welcomed more than 1,200 attendees from the restoration and management communities: non-profit and community organizations, Indian Country, academic and research institutions, businesses with an interest in the coast, and agencies from all levels of government. Restoration and management-interested groups or individuals gathered for an integrated discussion to explore issues, solutions, and lessons learned in their work. The theme of the 2016 conference, “Our Coasts, Our Future, Our Choice,” reflected the environmental, economic, and cultural importance of our coasts to residents of surrounding areas and to the nation as a whole. To initiate the conference’s 550 oral presentations in 110 sessions, as well as 200 poster presentations, the Marc J. Hershman Opening Plenary session on “The Gulf of Mexico- Proving Ground for Regional Recovery Strategies” discussed how restoration in the Gulf is faring as enormous resources start to pour in. The subsequent days highlighted climate change, economic vitality, as well as coastal communities across the nation and the ecosystems they rely upon through sessions, a coastal film series, and science communications coffee breaks. The closing plenary session covered “Changing Tides: What the New Congress and Administration Mean for Advancing Coastal Restoration and Management” with a panel discussion from leaders in coastal conservation, communications, and climate change policy. Among the 80 exhibitors was the Coastal Wetlands Planning, Protection, and Restoration Act. The CWPPRA exhibit debuted two new posters in the “Protect Our Coast” poster series campaign with accompanying banners in our photo booth, in addition to an array of available CWPPRA publications. As a follow up to the previous Brown Pelican and Louisiana iris posters, a coastal sunset scene and blue crab were each depicted. Participants were able to select from a variety of props to hold or wear while posing in front of the campaign poster banners. Participants posted their photos on multiple social media platforms with the campaign hashtag #ProtectOurCoast. Frequently included in the visionary imagery of Louisiana’s swamp landscape is gray, vine-like vegetation commonly seen draped on cypress branches. Thought to be a moss, Spanish moss is actually a bromeliad related to pineapples and succulent house plants in the same taxonomic family. Similarly, Spanish moss is not native to Spain, as is commonly thought; it is, however, native to South America and the Caribbean and grows from Texas to Virginia in the U.S. Inclined to moist areas, an ideal habitat for Spanish moss is a tree residing in a tropical swampland. Spanish moss is a rootless epiphyte—although Spanish moss is located on tree branches, it does not obtain food or water from the supporting tree as a parasite would. Spanish moss spreads and propagates from fragments known as festoons which are carried by wind or birds and initiate growth after landing in suitable conditions. An abundance of wetland wildlife utilize Spanish moss for survival needs, such as birds building nests and spiders and frogs hiding from predators.